I'm pretty ambitious whenever I get inspired to do a project – after research and testing, I consider the time constraints and how much experience I have doing whatever I'm interested in doing. I then usually take a step back and dial it down to something a bit more manageable. Instead of tackling the whole project all at once, I break it down and complete it in small chunks. This was the case after being inspired by some dancers using EL wire for their performance. In 2014, I started drawing out plans to build some light up costumes for my students at the old SparkFun building. I thought it would be cool and fun for them. If you remember from my Enginursday post last year, I shared two designs that I used with my students. The first design used EL tape and panels. The second design used non-addressable LED strips. It would have been a shame to not reuse the parts that I spent so much time building for seven students. Instead of designing a new costume, I decided to focus my energy on a small upgrade at their 2016 spring performance with Streetside Studios. For Mark III, I mixed different colors and replaced the custom power adapter with a motion controller. The motion controller used an ADXL335 triple axis analog accelerometer, transistor, and Arduino Pro Mini to switch the LEDs between patterns. It was simple and easy to use. Here's a quick demo of it in action with one of my bboys. How Do You Build Such a Thing? 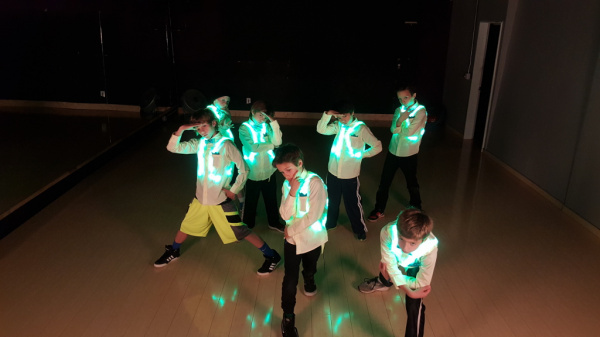 Assuming that you have already prepared the LEDs and harness tailored to your size, check out the tutorial linked below for more details on making your very own motion-controlled wearable LED dance harness! Oh and don&apos;t be scared of the numbers that I provided after calibrating all eight sensors; they're pretty interesting in my opinion. Our QC tests the microcontrollers out before it heads to our packaging so it should display a simple blink when powered up. With that assumption, I decided to just solder it straight on the board. I did consider having it modular so that I could remove the Arduino Pro Mini but it would have taken more space. I'm sure the QC tests the microcontrollers, but first, I've seen times over the past half century or so when once in a while, one will "slip through", and second, I've also seen "post test failures" in systems (wayward static electricity, and even wayward cosmic rays, can cause such). Just as an aside, I happen to have JTAG programmer that I haven't used in years, and a Pi AVR Programmer HAT that I've never gotten around to attaching to a Raspberry Pi. The Pi AVR programmer Hat is pretty sweet. I was able to test a few out when troubleshooting a few boards. I forgot to mention that I used digital 3DOFs from Adafruit for both these projects. They are easy to deal with under I2C, and even have address select line, allowing me to put both IMUs on the same I2C bus. Yeah, I remember you had talked about that flashy Santa hat build. Hopefully you find where it disappeared. The IMU brace sounds like a cool project.